Here are some images from Ellis Island, New York regarding 3 Bulthuis' who emmigrated to the U.S. in 1913. 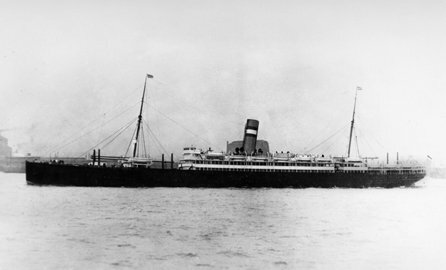 In 1913 Ellis Island records indicate that three Bulthuis' from Loppersum traveled on the Noordam out of Rotterdam to arrive in New York on February 5th. This is a picture of the Noordam on file at Ellis Island. This ship seemed to basically be a Dutch shuttle service. Everyone I have investigated that emmigrated to America at this time traveled on this ship. The three Bulthuis' traveling together are a Jan (John) 25 years old, his wife, Hendrika, 22 years old and his sister Ike, 23 years old. After discussing this with relatives and confirming it with a Bulthuis in the Netherlands, Ike changed her name to Helen after coming to America. This is Helen Bulthuis, future wife of Edward Teune. Here we see that Jan (John) listed his and his sister's father as H. Bulthuis (Hendrick Bulthuis). This further confirms the old family story of John convincing Helen to go to America with him and leaving Hendrick and family back in the Netherlands.